How much would you be willing to pay for a video game? Most of us moan about forking out £50/$60 for a new release, but how about $100,150? Perhaps that's a little above budget, but it's exactly what was recently paid for a sealed, first-run copy of Super Mario Bros. on the Nintendo Entertainment System. 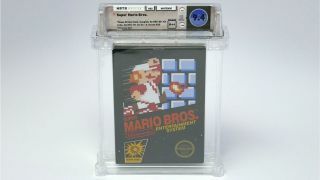 Traded at an collector's auction, the sale of the 34 year old game apparently broke a world record for the largest sum of money ever paid for a single video game, according to Wata Games, the game certficiation company involved in the deal. The reason this copy of Super Mario Bros. sold for so much is partly because of the way it has been preserved since its original production in 1985. The game is the only known "sticker sealed" version of its kind in existence, one of a mere handful to be released as part of Nintendo's first production run of Super Mario Bros. during its New York and L.A. test market launch. As for who bought Super Mario Bros. for $100,150, that honor belongs to three people, who purchased the item together in a co-ownership deal; Jim Halperin, the founder and co-chairman of Heritage Auctions, famed game collector Rich Lecce, and Pennsylvania-based video game store owner Zac Gieg. The seller of the item, however, has wished to remain anonymous, though apparently had no active interest to originally shift the copy over to new hands before now. Naturally, that six figure sum must have been enough to change their mind. Not many of us can afford $100,000 for a single NES title, but there are a bunch of new games 2019 on the way that can provide plenty of fun without draining the bank account.